Highly Concentrated Low Calorie Apple and Blackcurrant Soft Drink with Sweetener. 0% sugar. Real fruit in every drop. Made with real juice. 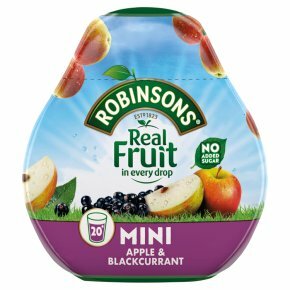 Mix with water to make 20 drinks* One squeeze* into water, just enough for the water to change colour, is all you need to create a tasty Robinsons drink when you're on the go. *3.3ml serving per 250ml of water. Shake well. Warning: Do not refill. Do not drink undiluted. If diluting for toddlers add extra water. Not recommended for use or to be handled by children under 36 months. Avoid contact with eyes; in case of contact promptly rinse with water.